For more than a 100 years, the construction of fountains in Kansas City has been part of the city's history. A tourist can spend a few days searching for them at leisure or a day walking around the Country Club Plaza to see over a dozen fountains. It doesn't stop there. There are supposedly over 200 fountains in Kansas City. In the late 1800s, fountains were implemented to feed animals, and chiefly the horses because there were so many of them. From the past to the present, the fountains have represented a form of art. Whenever you see a new building go up in Kansas City, don't be surprised if it has a fountain on site. 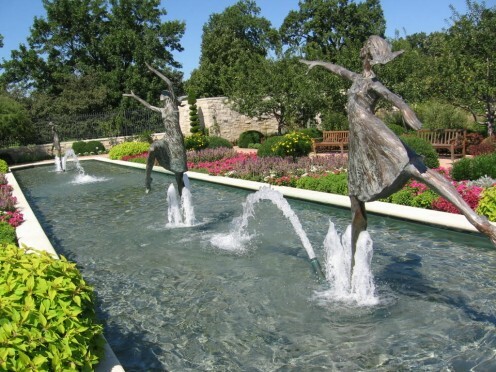 It has been said that outside of Rome, Kansas City probably has more fountains than any other city. In 1973, Harold and Peggy Rice established the City of Fountains Foundation in an effort to secure funds to build and maintain the fountains. 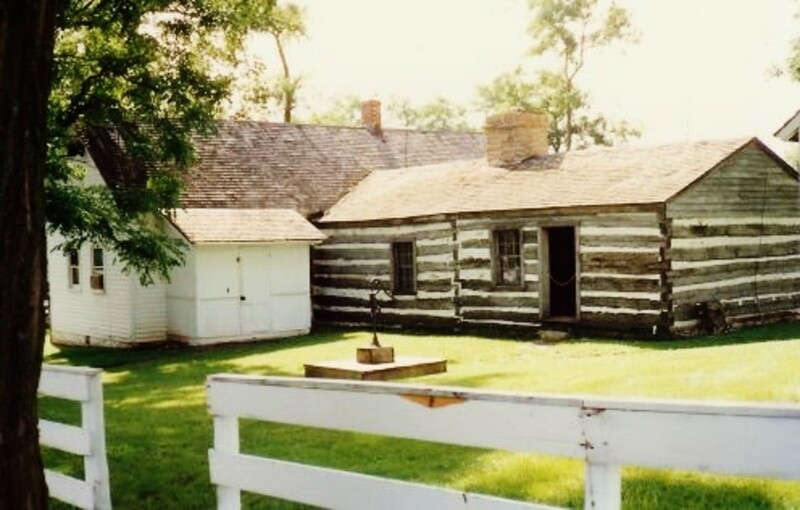 This foundation has a relationship with the Parks and Recreation Department of the city. The fountains are so popular, they are found on desk calendars and books have been written about them. The architecture that goes into the design of some of the fountains is remarkable and outstanding. Whether you're a resident of Kansas City or a tourist, it is apparent that these beautiful fountains are a part of this city's culture. 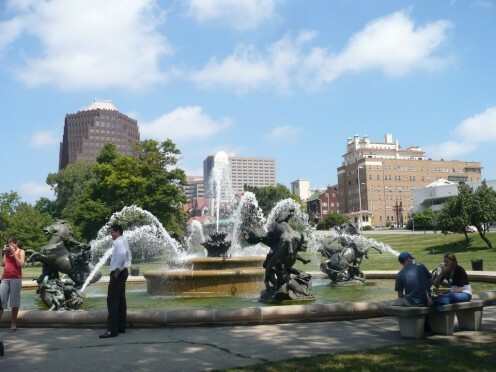 The J.C. Nichols Memorial Fountain is one of the most popular fountains in Kansas City. This fountain consisting of equestrian figures was constructed in 1910 by French sculptor, Henri-Léon Greber (b. 1855, d. 1941). 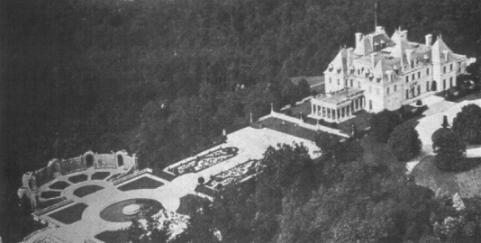 Greber originally designed the equestrian statues for an extraordinary mansion on Harbor Hill in Long Island, New York, which construction began in 1899. 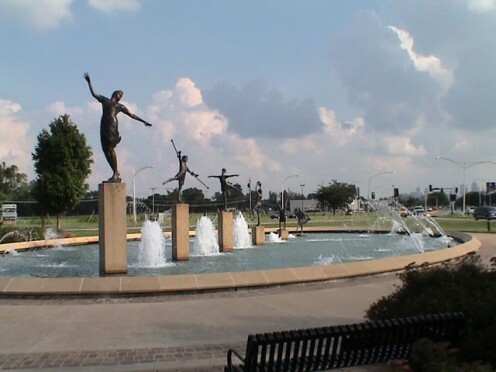 The statues were relocated to the Plaza area in Kansas City in 1957. 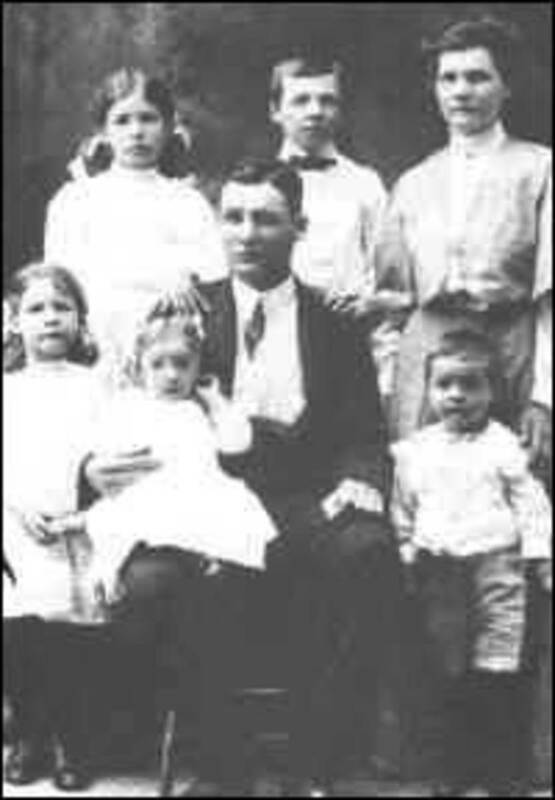 The J.C. Nichols Memorial Fountain is named after Jesse Clyde Nichols who is a noteworthy Kansas City, Missouri developer (1880-1950). J.C. Nichols who is credited for having established the Country Club Plaza, is the home of several fountains. This honorary fountain with its four very large bronze equestrian creations represent four major rivers of the world: the Rhine, the Seine, the Volga and the Mississippi. Why Does Kansas City Have So Many Fountains? If you visit Kansas City to taste its barbecue, then you have to spend some time touring the locations of the fountains. If you visit the Plaza on a sunny afternoon, you'll find yourself sitting on a bench in front of a fountain just to pass some time away and it's just plain relaxing. So, why does Kansas City have so many fountains? There is no particular reason that can be pinpointed, but there is a lot of history attached to the construction and design of the fountains. 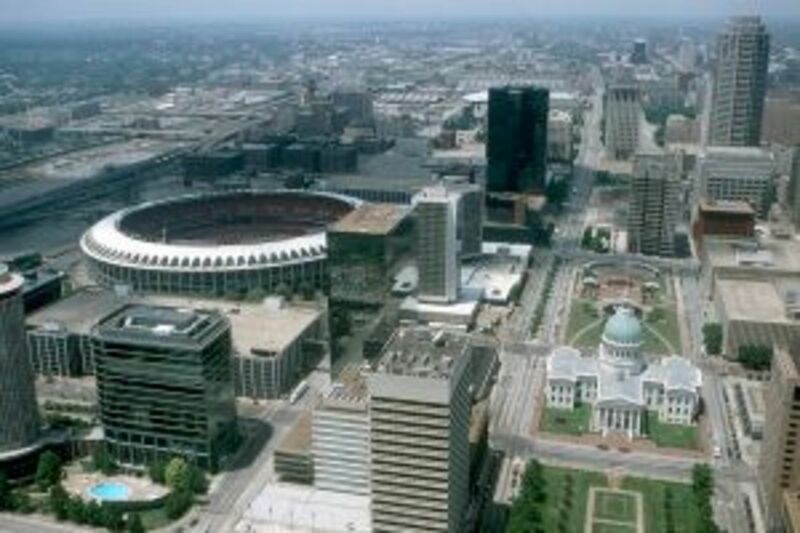 According to Shelley Hill's article published on cincinnati.com, Kansas City Overflows With Fountains, "Fountains seem to be everywhere here, spurting from bronze dolphins and winged seahorses at City Hall, Greek gods and mermaids in the main shopping district, even around the ballpark scoreboard" (1999). When the Kansas City Royals have their season opener, you can see some of the fountains spewing out blue water. There's even a grand fountain at the Royals Stadium. Likewise, if a tourist is here at the right time, the spraying water is pink to recognize National Breast Cancer Awareness month. 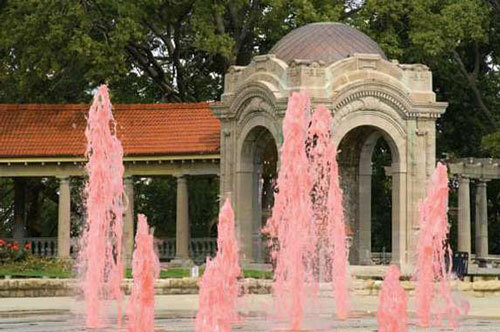 This year, 2012, will mark the 9th year that the University of Kansas Medical Center has lifted awareness of breast cancer with its support of the pink fountains memorializing both survivors and victims of breast cancer. This act isn't particular to just Kansas City, however, it's performed in other cities and countries as well. This fountain erected in 1995 is another favored one (see photo below). It represents children playing at different elevations, and includes a handicapped boy with his crutches in mid-air. Located in North Kansas City, if you're at a red light adjacent to the fountain, it's certainly fun to observe. The bronze sculptures in this remarkable and interesting fountain were designed by Tom Corbin and are representative of actual life-sized children that allegedly lived in the Northland. Every minute, this fountain is pumping out 5,000 gallons of water. Northland Fountain during the winter. 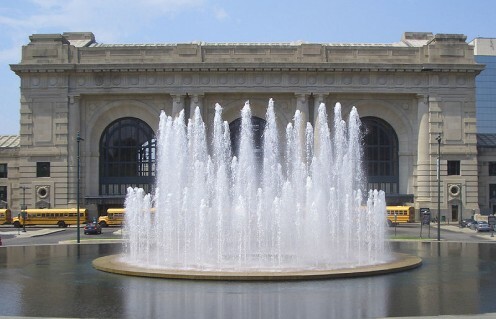 The Henry Wollman Bloch Fountain sits between Union Station and Liberty Memorial. It is right down the street from where I work. I love catching the view! It reminds me of the Bellagio Fountain in Las Vegas, NV, but it doesn't include music. My office is only steps away from this fountain. The sounds of the water slapping the ground on its return and then shooting back up is a sure sign of spring. 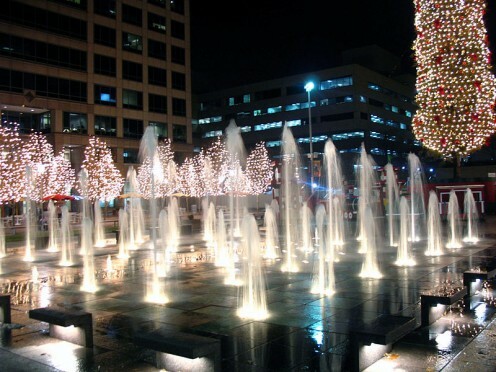 The conditions of winter certainly determine the operations of fountains, but when the Crown Center Square Fountain is able to operate surrounded by holiday lighting, it's spectacular. This fountain has over 40 water jets shooting out water to over 50 feet in the air. Over 2,200 gallons of water is pumped per minute from an underground reservoir of over 35,000 gallons of water. In the spring and summertime, if you happen to be outside near 5:00 p.m., you can witness a water show that is synchronized to music which are recordings of the Kansas City Symphony. Every hour and on the hour until 9:00 p.m. this musical event is displayed and on weekends, they occur daily. This is probably the only time when people are not allowed to play in the fountain which has been serving as a cooling off spot for years. Children especially love it! Great photos! We use to live in the KC area and visited the Plaza to go shopping. I did a painting of that fountain and forgot about that and the photos I took. I use to live in KC and loved seeing all the fountains. The big fountain at Country Club Plaza was always a great place to meet friends, I could sit for hours and watch the Bloch fountain in front of Union Station, and the ice on the Northland fountain in the winter is spectacular. Thanks for the memories. I love it too. Thanks for your comment. It is amazing how nothing bursts, and as it warms, how it all slowly melts away. Have a good week. I love the Northland fountain in winter...I wonder why they don't turn it off? Maybe just because they know it will make that wonderful sculpture on its own? Amazing the pipes don't burst. unknown spy, Thanks for coming by. Glad you enjoyed the hub. Thanks very much! wow i love it esp the pink fountain and the frozen one. great hub! Tonipet, thanks very much for your kind comments. The fountains are very cool! Have a great week. 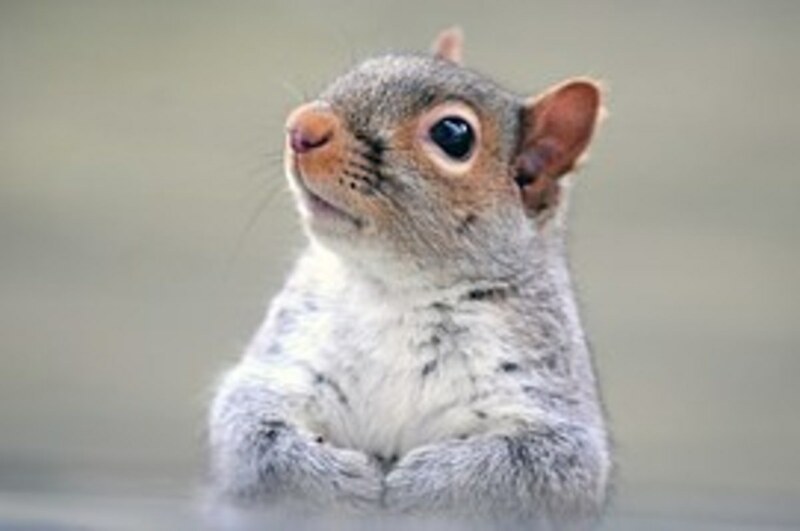 Very beautiful hub Cath, and the photos are lovely! I never really have given attention to fountains until this...from the most simple J.C Nichols to the pink waters children adore and to the dazzling Crown Center square's fountain, they're all fabulously refreshing. I'd love to visit them one by one someday. Thank you for the idea. I'm voting up and awesome! Vespawoolf, very glad to know your father lives close to the Plaza. It's a great venue to walk around, eat, shop and observe all the fountains. 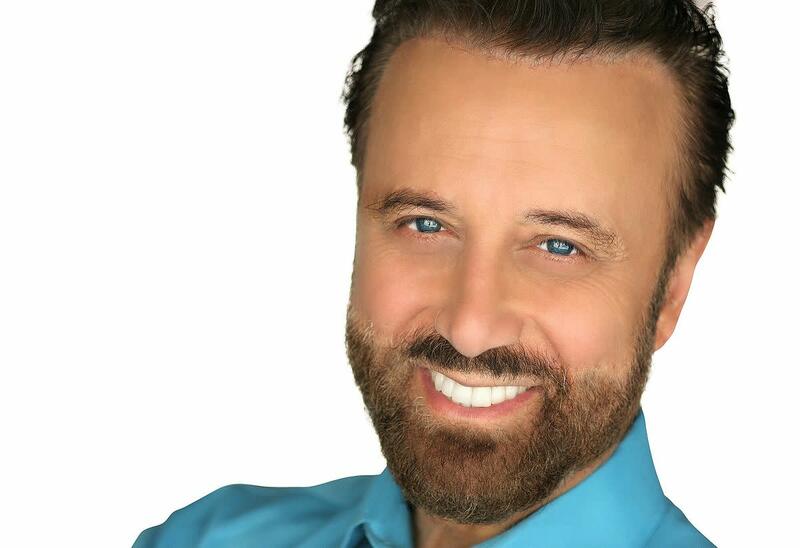 Have a great week and thanks for stopping by! My Father lives two blocks from the Plaza of KCMO, so I can attest to the beauty of these fountains. Gorgeous photos! Thank you for sharing your experience with us. And winter gives a nice feel to Northland Fountain, doesn't it? A great thing it doesn't shut down. 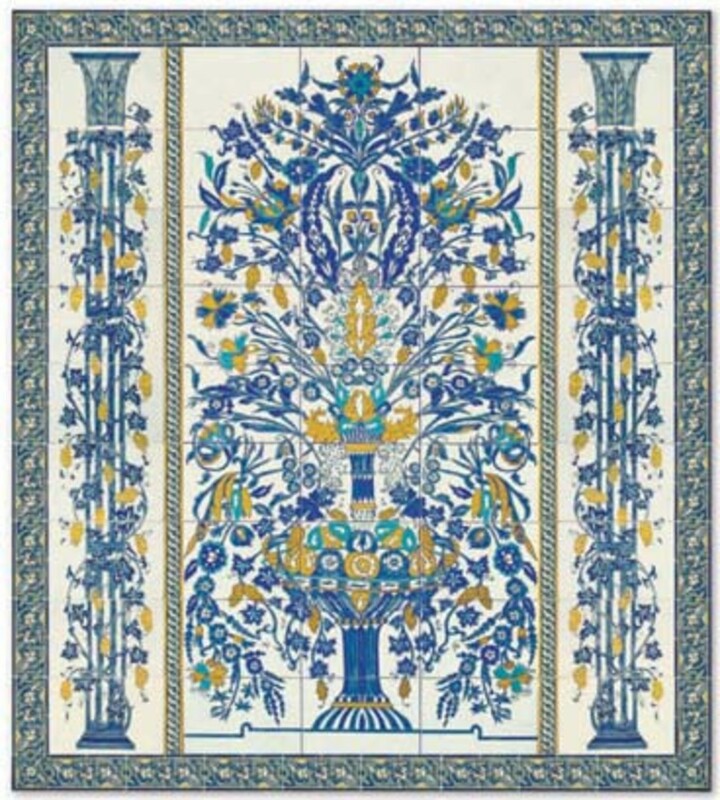 Such a beautiful sight and an interesting read! random, thank you for stopping by. All the fountains have something to offer. There are so many fountains in Kansas City! Have a great weekend. Great topic for a hub! Your photo choices are gorgeous. Thank you much Prasetio for the visit and the kind words. Glad you enjoyed! This is perfect hub. I had never know that Kansas has so many beautiful fountains. Thanks for writing and share with us. I enjoy all pictures here. Voted up and awesome! Thank you sammi. Glad you enjoyed this read. Have a good week. Wow! Amazing hub. Thanks for sharing! Fountains adds up to the beauty of the place and I feel relax when I see one. Sid, thanks for stopping by. I'm very glad you enjoyed it. Fountains are nearly akin to fireplaces, you can watch them for a very long time. Thanks. I've always loved photos of fountains, ever since I was a kid. 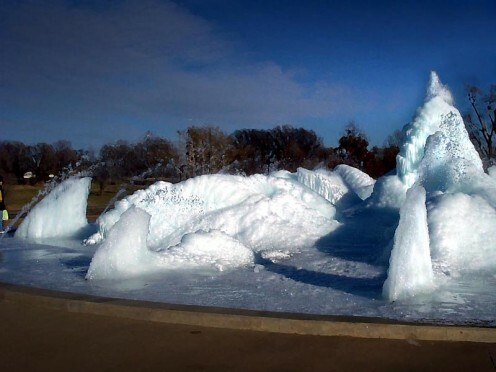 The Northland Fountain reminds me of the Logan Circle Fountain in Philadelphia, which froze up in a similar way. The video of the Henry Wollman Bloch fountain is a lovely, relaxing watch - with a great big surprise at the end. Voted up and beautiful, and shared. Sg, thanks much for your comment. Have a good weekend! Danette and Miss Hill, thanks very much for stopping by and leaving comments. Much appreciated. very nice hub - the fountains are fascinating. Nice article, I didn't know Kansas City had so many fountains. always exploring, thanks so much. Wait till you see the fountains in person. Thanks for stopping by. Best regards. This is such a beautiful hub. The fountains are magnificent. I would love to visit. Thank you for sharing..